Do You Have Talent for Drawing? Are You Concerned About the Environment? Enter This Contest! 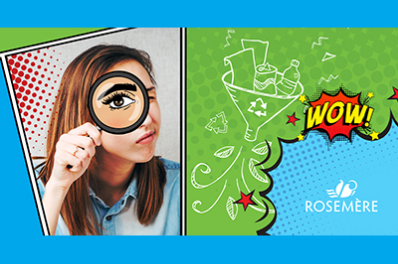 ROSEMÈRE, January 29, 2019 – The Town of Rosemère is looking for talented young Rosemere residents under the age of 18 to submit a short comic strip (maximum 8 panels) on environmental preservation. "We believe that comic strips, created by young Rosemerites, will be a much more lively and dynamic way to raise residents' awareness of this important subject than a simple text," stated Eric Westram, Mayor of Rosemère. From among the comic strips submitted, a committee will select five candidates and one of their creations will be published in an issue of Rosemère News! The winners will also receive a gift card redeemable at Place Rosemère. Send us your comic strip no later than March 1 via email (to communications@ville.rosemere.qc.ca) or by mail (to the Communications, Public Affairs and Citizen Relations Department, located at 100 Charbonneau Street, Rosemère, Québec J7A 3W1). We look forward to reading your comic strips. Thank you for helping us raise residents' awareness!